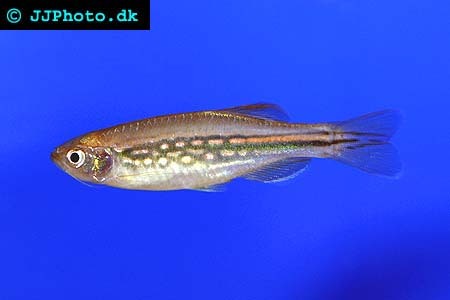 Common name: Moustached Danio, Danglia Danio, Olive Danio. Origin: Bangladesh, Bhutan, India, Nepal & Myanmar. Aquarium setup: Danio danglia (Moustached Danio) requires a large aquarium, due to adult size, with plenty of open space at the top for swimming. The aquarium should be decorated with dense vegetation along the sides. Like all Danios, Danio danglia (Moustached Danio) are a schooling fish and should be kept in a school of at least 5. Feeding: Danio danglia (Moustached Danio) are omnivores and will eat anything from flaked food to shrimp and smaller fish. This fish sometimes develop a liking to fruit and especially apples and bananas. 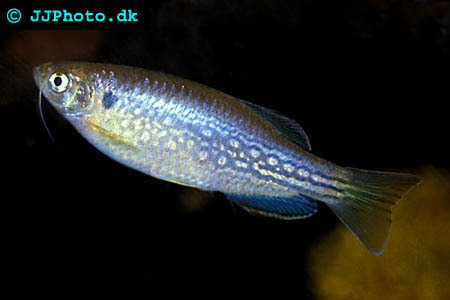 Breeding: It is very hard to tell male Danio danglia (Moustached Danio) from females as they only show the differences when the female is egglaiden. Breeding is the same as with other danios however consideration has to betaken to their large size and the breeding procedure adapted accordingly. The parents should, as with all Danios, be removed from the breeding aquarium as soon as the eggs are laid.